In 1979, there were rumblings from a number of minority professionals that they felt the need to connect, communicate, and network with other minority professionals in the geosciences. The voices of our colleagues became louder as time passed and on one given afternoon there was extensive conversation regarding the possibility of setting up an organization that would reach out and let others know that there was an opportunity for individuals with an aptitude in math and science to become Geoscientists. The people involved in these discussions were: Mr. Curtis Lucas, Mr. Allan Harris, Mr.
and compiled a list of geoscientists that we knew in the Houston area. This list was compiled with the intention of setting up an initial meeting to table our ideas and to at least make contact with other minority geoscience professionals. There was communication with Mr. Briggs in Dallas and Mr. Davis in Denver and they were charged with establishing similar sessions in their respective cities. In Houston, we needed a central location to meet, a willing host, and we also needed to have a figure that everyone knew and respected to get this thing off the ground. We found all of these items at the home of Dr. Mack Gipson, who had been a college professor at Virginia State University. indicated that there had been a lot of conversations about doing this kind of thing in the past. At that point, we indicated to him that we were involved with a group of individuals who were planning to do more than talk about it. He agreed to host the session. Mr. Lucas and I split a list of twenty-nine names and began calling and making an appeal to individuals to attend this meeting. We got warm responses from the majority of people that we talked with and the promise from several to spread the word. The meeting was a success. There was a room full of geoscience professionals buzzing with ideas, energy and enthusiasm. Dr. Gipson was a central figure along with Mr. Lucas that evening. It became tremendously obvious that this was at the least, a meeting that everyone there had been looking forward to for some time. Setting up an introductory session and getting people to attend was one thing; setting up an organization and getting everyone moving toward the same objectives would be quite another story. The meetings that followed were held at the homes of some of the charter members. The majority of the meetings were held at the home of Mr. Ken Yarbrough. Mr. Yarbrough was gracious enough to allow us to meet at his home which quickly became a forum for debate and conjecture on how the organization should be set up, what the objectives should be, who should compose the membership, should we incorporate, etc. At times, it seemed as though the discussions were endless. Other prominent figures arose in these sessions. A fiery, young woman from Sierra Leone, named Ms. Rachel Taylor, who was at the time with Sohio, shared her passion and energy to chair a committee to establish the constitution and bylaws of the organization. Ms. Laverne Gentry, Mr.
could stand. 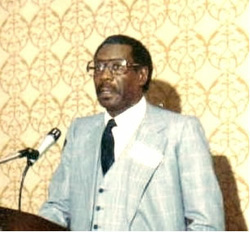 Mr. Walter Alexander, an established independent at the time, became a strong advocate of the organization. Dr. John Leftwich and Mr. Reginald Spiller became champions of ideas to involve and inspire youth to consider careers in the geosciences. At a very early point in these series of meetings, we selected an organization name and a set of objectives that were reviewed, amended, and voted on by the charter members. The name that was agreed upon was The National Association of Black Geologists and Geophysicists. The objectives that we established were accepted and remain a focus of our organization today. Its program of scholarship support, local interaction with schools and professional Meetings work well to support the enhanced participation of ethnic minorities in geosciences. Through the years, the NABGG has awarded over $300,000 to over 130 students for undergraduate and graduate study. Earth Day Network, and the Digital Library for Earth System Education (DLESE). NABGG was established and incorporated in 1981 in Houston, Texas and has been an active organization nationwide with members in the oil and gas industry, academia, in government, and most importantly in colleges and universities.